TGIF Quick Quotes Fans! Kate here on the blog today sharing a quick video showing you how quick and easy it is to create a pretty journaling tag with Quick Quotes Cracklin' Rose 6x6 Paper Pad and Powder Puff Chalking Inks in Amaretto and Mocha Mama. 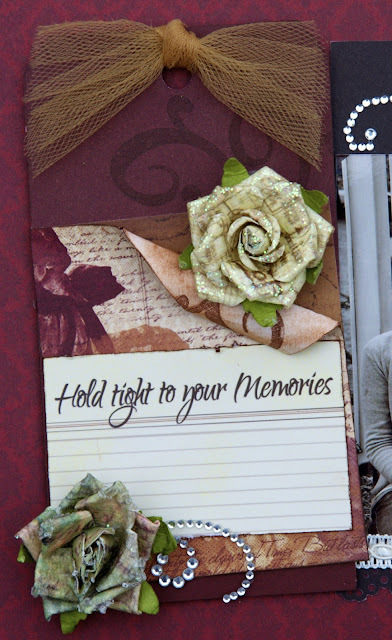 As you saw in my video, creating a pretty journaling tag to compliment a layout or add to a card is so simple and fun when using Quick Quotes products. 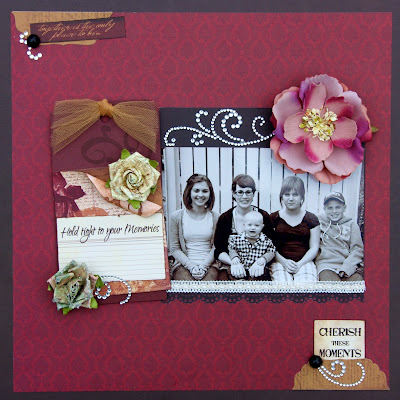 I used the same Cracklin' Rose 6 x6 Paper Pad and Powder Puff Chalking Inks for my sentiment clusters and photo mat on the layout below. The rich colors in the Cracklin' Rose Collection are the perfect compliment to my black and white photo of all the fabulous children in my life. The design is simple and pretty as to not take away from the photo and to showcase the pretty papers. I hope you enjoyed my video and layout today. If you create a journaling tag of your own with Quick Quotes papers, I'd love to see it. Be sure to share it on the Quick Quotes Facebook Fan Page! Beautiful tag. Thanks for th video. Your tag is beautiful. I love how you added it to your layout! very pretty and loved the video!! Gorgeous katie!! The tag is lovely and the video was great!! Thanks for the inspiration!